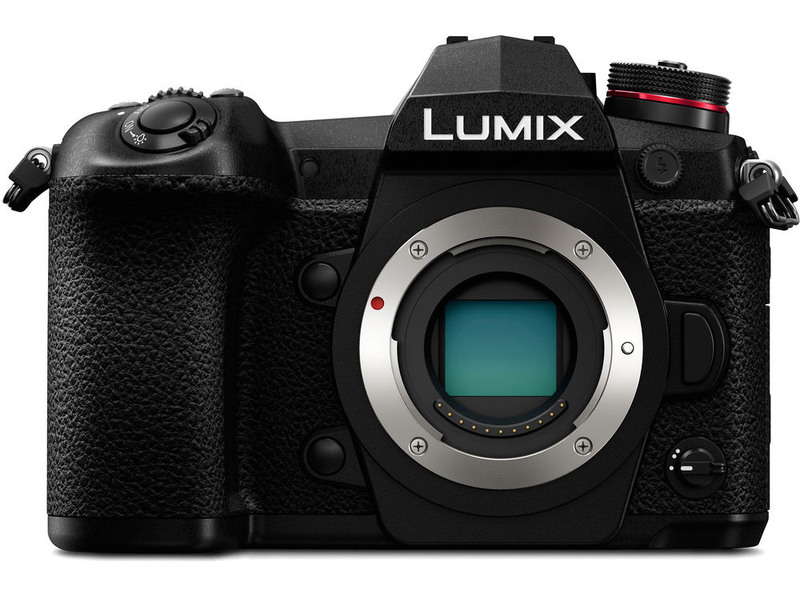 Like Panasonic's other Lumix cameras, the G9 uses a Micro Four Thirds sensor, which is half the size of a full-frame sensor. This means that lens focal lengths should be doubled to get the full-frame equivalent. The camera also uses the Micro Four Thirds mount, which is shared by Olympus cameras. This allows for the use of lenses from both camera makers, as well as those offered by third-party companies. The Lumix G9 has a 20.3-MP Live MOS sensor that has the ability to record an 80-MP image by capturing and merging eight photos into a single image. Visually, the Lumix G9 has a decidedly professional look with a more aggressive appearance that features sharp angles on the front of the viewfinder housing and a large hand grip. The camera has both a 3.0-inch Live View LCD touchscreen monitor and an OLED electronic viewfinder with a high 120 frames per second refresh rate, which should provide for stutter-free viewing and shooting. RAW and JPG images, as well as video, are saved to SD cards. The Lumix G9 has two memory card slots, which allow for simultaneous or sequential storage. Both slots can accept the high-speed UHS-II memory cards, which are required for recording 4K video. The Lumix G9 has five-axis image stabilization, which can work in conjunction with image-stabilized lenses for recording still images and video. There are electronic and manual shutters with the manual shutter having a speed range of 1/8,000 to 60 seconds plus B and the electronic shutter having a range of 1/32,000 to one second. Panasonic says the manual shutter’s life is rated for 200,000 actuations. It can shoot at up to 12 frames per second with the manual shutter and 20 frames per second with the electronic shutter. Perhaps in a nod to optical digital SLRs, the Lumix G9 has a top-mounted LCD panel that displays pertinent exposure information. That’s a feature that has disappeared with mirrorless cameras, which have very thin bodies and don’t provide enough space for a top-mounted LCD panel. Although the Lumix GH5 is the favorite among videographers, the Lumix G9 is no slouch when it comes to shooting video. The G9 is able to record 4K video at 60p, as well as high-speed 60 frames per second at that resolution and 180 frames per second at Full HD resolution. There are jacks for a microphone and headphone, as well as HDMI and USB 3.0 Gen. 1 Micro-B ports. The Lumix G9 is capable of shooting in inclimate conditions with all buttons, switches, joints and doors sealed and the ability to operate in temperatures as low as -10 degrees Fahrenheit. There is no built-in flash. The camera has a hot shoe, and flash synchronization is 1/250 with first- and second-curtain synchronization. The battery is rated for a maximum of 400 images using Live View (380 with the electronic viewfinder). A new battery grip, DMW-BGG9 (US$347.99), is available. In addition to holding a second battery and doubling shooting capacity, it also provides a shutter release for shooting portraits and replicates some of the Lumix G9’s other controls to make them quickly accessible when shooting vertically. There is no software provided in the box. Instead, the RAW image editor, SILKYPIX Developer Studio, needs to be downloaded. The full manual also needs to be downloaded. The Lumix G9 is 5.4 x 3.8 x 3.6 inches (136.9 x 97.3 x 91.6mm) and weighs about 1.5 pounds (658 grams). The body only (it is not being sold with a lens) will be available in mid-January 2018 and will cost US$1,699.99. The Panasonic Lumix G9 use a Micro Four Thirds sensor. The rear of the Panasonic Lumix G9. This promotional graphic explains the Panasonic Lumix G9's "Frame Drive Mode" collar. The Panasonic Lumix G9's LCD monitor is touch-enabled and also fully articulates. This promotional graphic explains some of the functions of the Panasonic Lumix G9's rear controls. This promotional graphic explains more of the Panasonic Lumix G9's controls. The Panasonic Lumix G9 has a secondary LCD panel on the top deck to display pertinent information. This promotional graphic explains the Panasonic Lumix G9's LCD panel on the top deck. The Panasonic Lumix G9 does not have a built-in flash. The Panasonic Lumix G9 DMW-BGG9 battery grip is purchased separately. The Panasonic Lumix G9 DMW-BGG9 battery grip is seen mounted to the camera. The Panasonic Lumix G9 battery can be charged in-camera while it is being used. The Panasonic Lumix G9 has two memory-card slots. This promotional graphic explains the Panasonic Lumix G9's two memory card slots.